This is a special version of Preview by Numbers, in which we investigate Arsenal's chances of finishing fourth at the end of this season, based on the remaining fixtures to be played. The match preview for this Saturday's game at Liverpool will, as usual, be posted on Friday morning. nice-looking trophy. Photo: Chris Parry. 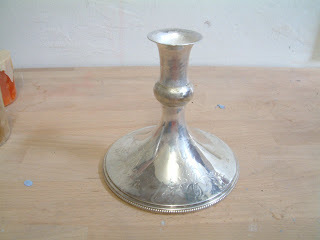 We all know that nobody really considers fourth place to be a trophy. You do not get a piece of silverware for just making the Champions League (and not even necessarily the group stage, at that) and it would be ludicrous to compare qualification to the tangibility of a trophy. But, given the low points of this season to date, I think we've all come to terms with the fact that finishing short of fourth place would be the ultimate failing. The good news? Arsenal sits in fourth place right now, on goals scored (the second tie-breaker,) ahead of Chelsea. With a dozen games to play this season, Arsenal just have to do as well, or better, than the likes of Chelsea, Liverpool, and Newcastle, to secure a top four finish. The bad news? 12 games is a lot and two and a half months is a long time. A lot can change between now and the end of this season and there are a lot of unpredictable factors to remember: injuries for one, form for another. Mathematical prognostication cannot take into account whether or not a team starts to get hot. points. Click the graph to enlarge. So, what we know is that there is a 100% chance Arsenal finish in the top four if they win all 12 of their remaining matches and end the season with 82 points. But that's impractical. The better question is, how many points will Arsenal need in order to finish top four? For that, we consult Sports Club Stats, a Web site which runs computer simulations based on previous results from this season to determine the odds of clubs finishing at a certain spot in the table. 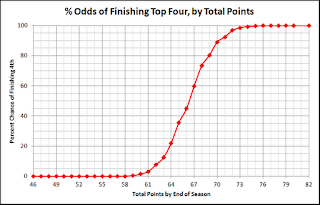 The graph shows possible total points at season's end on the X-axis and the corresponding odds of Arsenal finishing in the top four on the Y-axis. 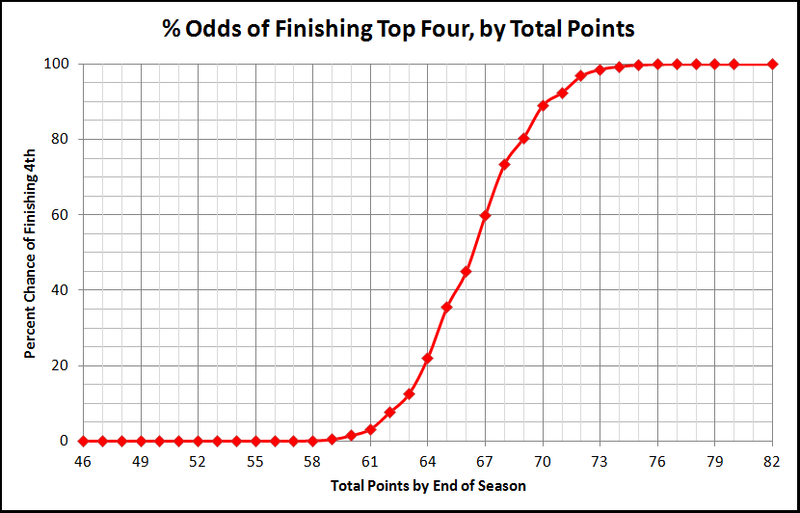 You'll see that through about five wins (61 points,) there's still under a 5% chance of finishing in the top four. But by eight wins (70 points,) it's close to 90%. At nine wins, it's almost 99%. So basically, if Arsenal wins nine of their final 12 games, it's nearly a lock that they'll have Champions League football next year. Even with 10 wins, though, there are some simulations that show Arsenal finishing in fifth, but the odds of that are microscopic. The magic number right now looks like eight to nine wins. And honestly, if Arsenal wins nine times from here on out and it's not enough, then really, that means a rival team went on an absurdly impressive run. To investigate whether they could pull off that feat again (which would actually total to 12 wins from 15, considering Arsenal have currently won three straight in the league,) we need to look at their strength of schedule. Just how difficult will these 12 matches be? Upcoming opponent's points per game. Home and Away is for Arsenal. To accomplish this, we look at points per game earned by the opponents either at home or on the road, depending on where the match will be. We'll start with Arsenal's massive match at Anfield on Saturday. Liverpool are currently in seventh, but have a game in hand. Even still, an Arsenal win on Saturday would move them 10 points clear of the Merseyside Reds. Liverpool have not lost at home this year, but they also haven't won all that much at Anfield either: four wins and eight draws. That's 20 points in 12 matches, or a points per game total of 1.667. We extend this process to Arsenal's other 11 matches that follow to determine the average quality of their opponents. Newcastle visit the Emirates on March 12; they've picked up 1.385 points per game on their road travels. If you take the average of Arsenal's remaining opponents, it comes to 1.254 points per game. For Liverpool, their 13 opponents average to 1.291 points per game. For Newcastle, it's 1.365 points per game. For Chelsea, it's 1.408 points per game, weighted by the fact that they still have to play Manchester City at Eastlands, where they have not lost this year. These numbers mean that on the face of things, Arsenal's run-in is easier than their rivals for fourth. But that's just one side of the equation. 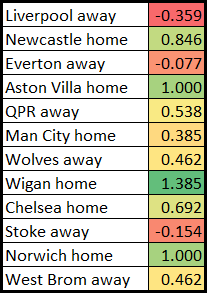 Yes, QPR's home points per game is lower than Wigan's away points per game, but which fixture will be the most winnable for Arsenal: QPR at Loftus Road or Wigan at the Emirates? It has to be the latter, right? That's why you need to take Arsenal's home and road record into account as well. This chart shows the difference between Arsenal's points per game and their opponents' points per game, taking into account which team is home and which team is away. The higher the difference in Arsenal's favor, you can argue the more winnable it is for Arsenal. This means that Arsenal's most winnable game left on the schedule is Wigan at home (+1.385) and their least winnable game is Saturday's (-0.359.) Of course, all of these numbers change with each result, so by the time each game is played, it's hard to tell which ones will actually be more winnable. The average "winnability" of Arsenal's remaining games gives you +0.515. For Chelsea, it's +0.361. For Newcastle, it's +0.288. For Liverpool, it's +0.281. This again shows that Arsenal's run-in looks easier than their rivals' run-in. But again, averaging out how "mathematically winnable" a game is basically means nothing in the grand scheme of things. You can't win games on paper (or blog posts.) Sure, it's good news for Arsenal that their run-in isn't terrifying. This is aided by the fact that they play most of the big boys (Chelsea, City, and to an extent, Newcastle) at the Emirates. Can You Pick Out From Where the Nine Wins Come? If Arsenal needs to win nine games to clinch fourth, can you look at the fixtures list, circle a bunch of games and say "there they are. Nine wins"? I can, however, point to six games that Arsenal must win if they have fourth place aspirations. They are, at the heart of it, the three most winnable home games and the three most winnable road games: Wigan at home on April 14, Aston Villa at home on March 24, Norwich at home on May 5, QPR away on March 31, Wolves away on April 11, and West Brom away on May 13. These six games have to be wins if Arsenal are serious about playing in the Champions League next season. From there, it's a matter of finding three wins from the remaining six matches; in order of winnability, they are: Newcastle at home on March 12, Chelsea at home on April 21, Manchester City at home on April 8, Stoke City away on April 28, Everton away to be arranged, and Liverpool away on Saturday. 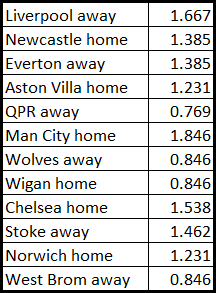 Note that home games are considered more inherently winnable, as Arsenal have picked up 2.23 points per game at home this year and 1.31 points per game on their travels. If Arsenal can beat their rivals for fourth spot: Liverpool this weekend, Newcastle next week, and Chelsea at the end of April, then that would make nine. Plus, preventing your rivals from picking up points only reduces how many points you yourself need to pick up. Everton away feels like it would be a good statement win as well. Stoke away, though, is always dicey; I'd never expect a win at the Britannia, to be brutally honest. Not while they have those towels. If Arsenal wins at Anfield on Saturday, these numbers change drastically for the better. If they lose, they, of course, change for the worse. They'll still need nine wins from 11 games, while simultaneously allowing Liverpool back into the race. In either case, there are nine wins to go. Let's get them.